The eighth edition of the Indodefence Expo & Forum will be held from 7 to 10 November 2018. The companies of the Aerospace and Defence divisions of CZECHOSLOVAK GROUP (CSG) are going to take part in this prestigious event, where they will present their products and services. 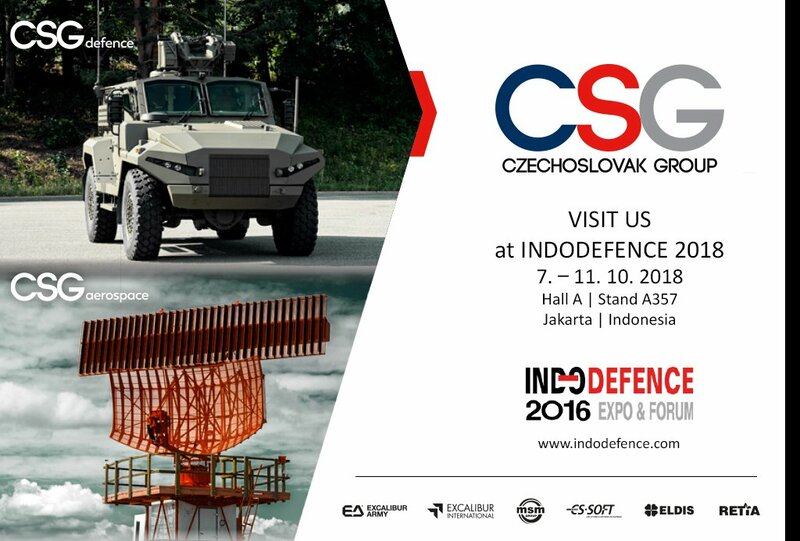 The Czech industry and CZECHOSLOVAK GROUP will be represented by EXCALIBUR ARMY, EXCALIBUR INTERNATIONAL, MSM, CS SOFT, ELDIS and RETIA at the Indodefence 2018 trade fair. In the A357 exposition in Hall A with a total area of 180 m2, armoured land vehicles, munitions of various calibres and small arms, as well as air traffic control and radar equipment will be presented to professionals and general public as well. "We see participation at Indodefence as an important opportunity to present both individual companies and the entire CZECHOSLOVAK GROUP holding. In the Southeast Asia region, we have a great potential to build new partnerships, which is why we took part in Indodefence two years ago. At the time, we concluded several important contracts at this trade fair," says Lukáš Novotný, the marketing manager of CZECHOSLOVAK GROUP. Southeast Asian countries have resources and are interested in advanced technology. That is why there is a great interest in Czech and Slovak products, which are known for being technically and technologically advanced. From the point of view of the CZECHOSLOVAK GROUP, the traditional and established brands that are members or partners of the holding are a great asset as well. For example, TATRA is well-known and popular in Southeast Asia. The previous edition of Indodefence was held in November 2016. It was attended by more than 25,000 visitors, who had the chance to see the products of 800 exhibitors from 55 countries, indicating the significance of the event for the region. Besides the fair itself, several conferences and other accompanying programs are held as part of the accompanying program. Press service of CZECHOSLOVAK GROUP a.s.